The winner of the annual public speaking competition for local secondary schools this year was Beverlyn Agyemang of St Marys Catholic High School with her thought-provoking talk entitled ‘Who Am I’. The event was organised for the 52nd consecutive year by the Rotary Club of Chesterfield and held as part of the club’s weekly meeting at the Olde House, Newbold, on Friday 23 March 2018. 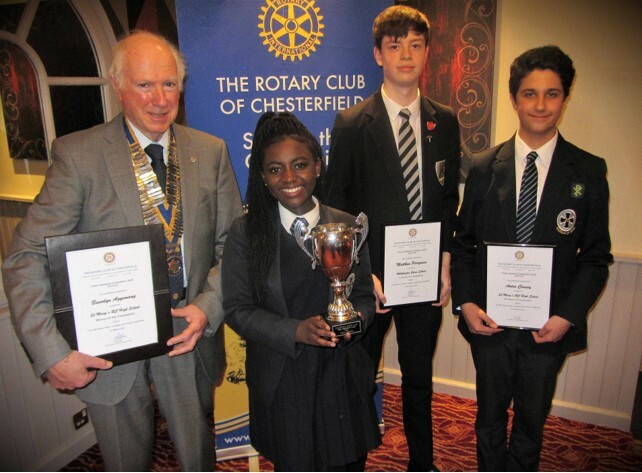 Following a high-quality competition, Chesterfield Rotary president Peter Barr presented the cup and certificates to winner Beverlyn Agyemang (St Mary’s), and the two runners-up Matthew Perryman (Whittington Green) and Anton Causey (St Mary’s).